van Slegtenhorst et al. (2007) identified the S. pombe FLCN homologue, BHD1, and used homologous recombination to generate a novel deletion strain. 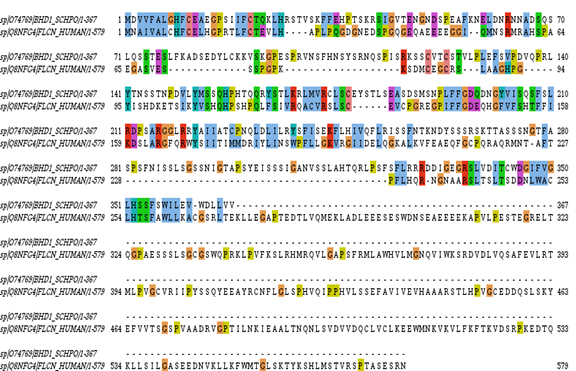 BHD1 only has homology with the N-terminal region of the vertebrate protein (see alignment), but these experiments suggest that yeast FLCN is important for amino acid homeostasis, and potentially activates the mTOR homologue Tor2. Legend: Alignment of S. pombe and human folliculin. S.pombe folliculin only aligns to the N-terminal region of human folliculin. Alignment made using MUSCLE (Edgar, 2004), manually edited using Jalview (Waterhouse et al., 2009) and displayed with Clustal colours. Alignments performed by Angela Pacitto. The S. cerevisiae orthologues of FLCN and FNIP1/2 are Lst7 and Lst4 respectively. Péli-Gulli et al., (2015) found that Lst7 and Lst4 form a complex that mediates amino acid stimulation of TORC1 signalling.